2 Note Well Any submission to the IETF intended by the Contributor for publication as all or part of an IETF Internet-Draft or RFC and any statement made within the context of an IETF activity is considered an "IETF Contribution". Such statements include oral statements in IETF sessions, as well as written and electronic communications made at any time or place, which are addressed to: –The IETF plenary session –The IESG, or any member thereof on behalf of the IESG –Any IETF mailing list, including the IETF list itself, any working group or design team list, or any other list functioning under IETF auspices –Any IETF working group or portion thereof –The IAB or any member thereof on behalf of the IAB –The RFC Editor or the Internet-Drafts function All IETF Contributions are subject to the rules of RFC 5378 and RFC 3979 (updated by RFC 4879).RFC 5378RFC 3979RFC 4879 Statements made outside of an IETF session, mailing list or other function, that are clearly not intended to be input to an IETF activity, group or function, are not IETF Contributions in the context of this notice. Please consult RFC 5378 and RFC 3979 for details.RFC 5378RFC 3979 A participant in any IETF activity is deemed to accept all IETF rules of process, as documented in Best Current Practices RFCs and IESG Statements. A participant in any IETF activity acknowledges that written, audio and video records of meetings may be made and may be available to the public. 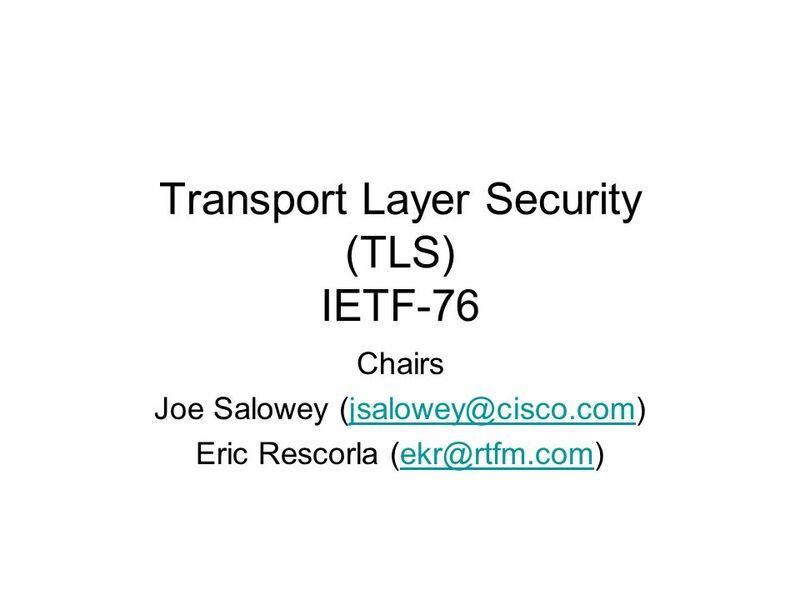 Download ppt "Transport Layer Security (TLS) IETF-76 Chairs Joe Salowey Eric Rescorla"
1 Yet Another Mail Working Group IETF 75 July 30, 2009. 1 ISMS WG 79th IETF Beijing November 10, 2010 Goal:Creating a security model for SNMPv3 that will meet the security and operational needs of network administrators. HIP WG Stockholm, Sweden THURSDAY, July 30, 2009, Congresshall C.
IETF #77 - NETMOD WG session1 NETMOD WG IETF 77, Anaheim, CA, USA March 23, David Kessens David Partain. Joint meeting of TICTOC - Timing over IP Connections and Transfer Of Clock and NTP - Network Timing Protocol Chairs: Yaakov Stein yaakov_s at rad.com Karen. Tictoc working group Thursday, 31 March CEST (1540 – 1740 UTC) Karen ODonoghue and Yaakov Stein, co-chairs. MPTCP – MULTIPATH TCP WG meeting #5 Nov 8 th & 10 th 2010 Beijing, ietf-79 Yoshifumi Nishida Philip Eardley. RMT WG Status Brian Adamson / Lorenzo Vicisano 11 November 2009 IETF 76 - Hiroshima. NETMOD Agenda David Kessens Jürgen Schönwälder IETF 80 - NETMOD WG. Emergency Context Resolution with Internet Technologies Marc Linsner Roger Marshall IETF 89 London March 5, 2014. IS-IS WG IETF-80 Prague Chris Hopps Dave Ward. 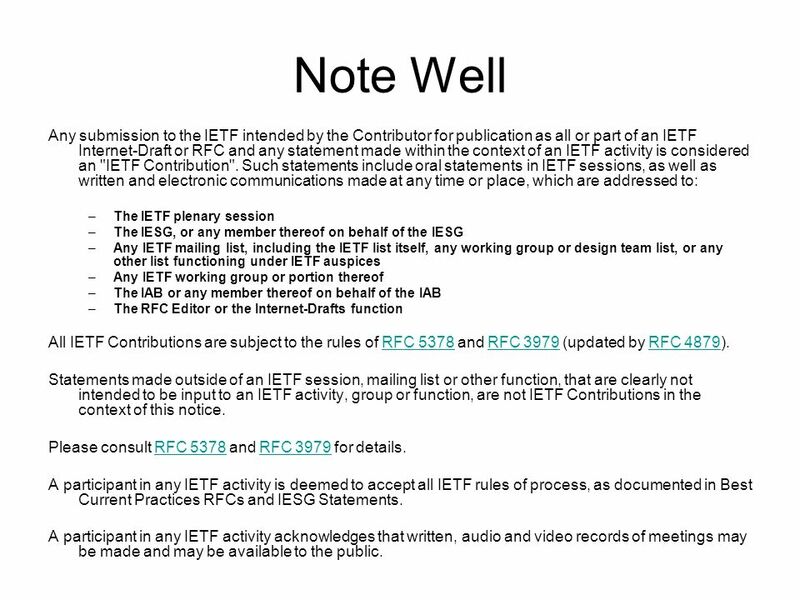 Note Well Any submission to the IETF intended by the Contributor for publication as all or part of an IETF. Secure Telephone Identity Revisited STIR IETF 88. STRAW IETF#91, Honolulu, USA. Victor Pascual Christer Holmberg. OAuth 2.0 Security IETF OAuth WG Conference Call, 14th December 2012. Transport Layer Security (TLS) IETF-72, Dublin July 27, 2008 Chairs: Eric Rescorla Joseph Salowey.